The Commandant of Humberside and South Yorkshire Army Cadet Force has marked a major milestone, having served over 40 years for his ACF county. Colonel David Fuller OBE marked the occasion at the East Hull Cadet Centre, the place he first walked into on 6th September 1972, on his 18th birthday, keen to become an adult instructor with the ACF. "Apparently I was not sent a recall message on my start date for college, which should have been the following Monday and hence I was a week early arriving in Hull. East Hull detachment was less than a mile from my digs and the nearest unit for me, and I decided to walk in and see what I could offer them. It just happened to be my 18th birthday when I made this decision". Having been a Cadet in his school, Wymondham College, in Norfolk, David was no stranger to the ACF, and soon fitted in, being appointed as Under Officer in April 1973, commissioned only a year later, aged just 19 and becoming the last officer commissioned into the East Riding ACF, before the force amalgamated in April 1974 to form Humberside ACF. David served in many detachments within the East Riding before commanding both A and B Company of the force, the latter while studying for a part time degree in Mechanical and Electrical Engineering, where he gained First Class Honours. In 1995 he was tasked as the Public Relations Officer, an appointment which he enjoyed immensely, with the result that the county was awarded the national Wilkinson Sword of PR Excellence for two consecutive years in 1999 and 2000. 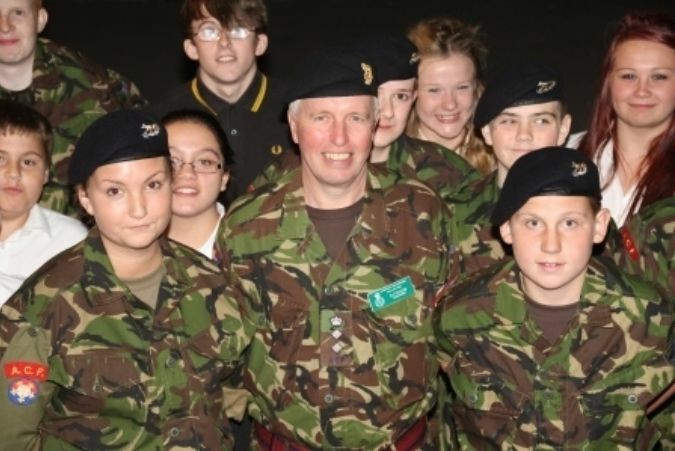 During 2003 he developed and gained approval for the idea of producing a Tri-Service Cadet magazine, the Cadet Review, for the three services across Yorkshire and the Humber. Supported by the Reserve Forces' and Cadets' Association (RFCA), this commenced production soon afterwards and has been a great success in highlighting the achievements of the cadets in the region. David assumed command of Humberside and South Yorkshire ACF, the largest ACF County in the country, with some 1700 cadets and 350 Officers and Instructors, on 1st January 2007 and was promoted to Colonel, in a role he continues to thoroughly enjoy. In addition he was appointed OBE in the Queen’s Birthday Honours List in June 2011, in recognition of his service to the ACF. "I have thoroughly enjoyed almost all of the intervening 40 years to date and have always wished to put something back into the young people of this area, in much the same way as I benefited from my time as a cadet". "Some of my most enjoyable achievements include command of my first detachment, Beverley Grammar School, and seeing the difference we have collectively made to young people who would otherwise have been underachievers, winning the PR Sword of Excellence twice in a row, commanding the best county force in the country, training and leading selection for three Himalaya expeditions and being able to fulfil the ambition to publish the Cadet Review". "Much has changed for the Cadet Force in that time, and the uniform is much more comfortable. The battle dress which I first started wearing was dreadfully uncomfortable. It’s also a much better and more professional organisation, despite all the additional paperwork!" David is also a qualified Watermanship Safety Officer and has run safe training on water based activities for over 30 years, which is little change from his day job, as the Regional Principal Marine Surveyor, for the Maritime and Coastguard Agency, where he is responsible for the survey and inspection of some 2,000 fishing vessels, covering a patch between the Scottish border and the Devon/Dorset border on the east and south coast of the UK, together with some 30 large fishing vessels which operate in the Falkland Islands.